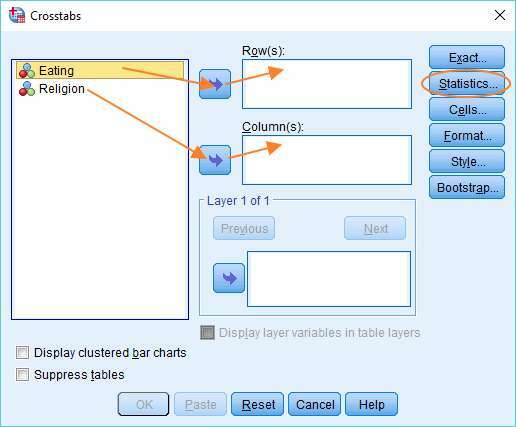 This quick tutorial will show you how to calculate the chi square statistic in SPSS and also how to interpret the result of the calculation. As usual with these quick tutorials, we’re starting from the assumption that you have already imported your data into SPSS, and you’re looking at a Data View screen that looks something like this (though with different categorical values, and perhaps additional columns). We want to find out whether the two categorical variables (in this case, Eating and Religion) are associated with each other – that is, are they dependent or independent? The chi square test is appropriate for this task. 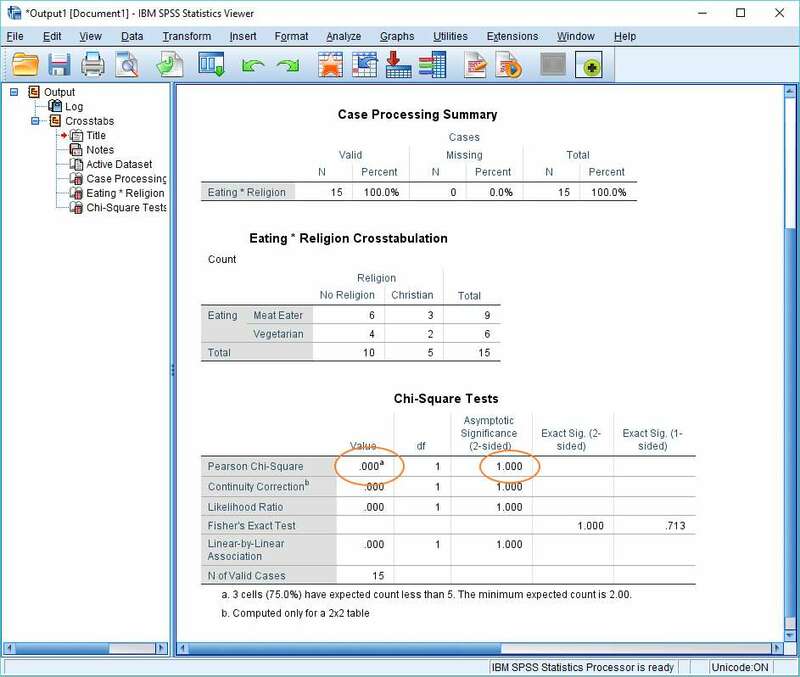 To begin the calculation, click on Analyze -> Descriptive Statistics -> Crosstabs. This will cause the crosstabs dialog to appear. You’ll see your variables on the left. In our example, it’s two variables, but if you have more than two, you’ll need to identify the two you want to test for independence. You need to get one of these variables into the Row box, and the other into the Column box. It doesn’t matter which variable goes into which box. You can drag and drop, or use the arrows, as above. Once you’ve got your variables into their correct boxes, you can set up the chi square test by hitting the Statistics button, and selecting the Chi-square option in the dialog that appears. If you also want a measure of effect size, select Phi and Cramer’s V in the same dialog box, and then press Continue, otherwise just press Continue. 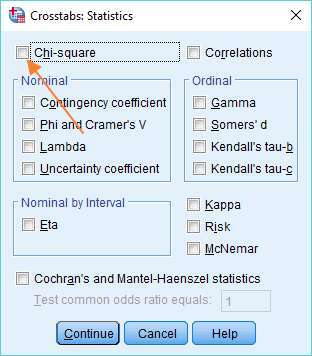 Press OK to generate the chi square statistic and crosstabs table. The results page looks a little complex, but actually isn’t as baffling as it might at first seem. The chi square statistic appears in the Value column of the Chi-Square Tests table immediately to the right of “Pearson Chi-Square”. In this example, the value of the chi square statistic is 0. The p-value appears in the same row in the “Asymptotic Significance (2-sided)” column. The result is significant if this value is equal to or less than the designated alpha level (normally 0.05). In this case, the p-value is greater than any plausible alpha value, so we’d accept the null hypothesis that asserts that the two variables are independent of each other. To put it simply, the result is not significant – the data provides no evidence that religion plays a role in the choice to be vegetarian. 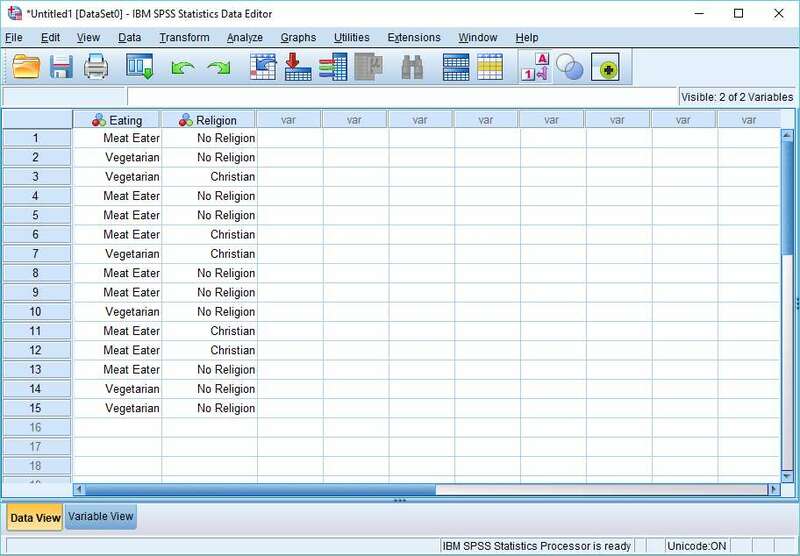 If you take a look at the crosstabs table (“Eating*Religion Crosstabulation”), you can easily see that the chi square test result is consistent with the data. There is no difference in the proportion of meat eaters to vegetarians in the No Religion and Christian groups. In both cases, meat eaters outnumber vegetarians by a ratio of 3 to 2. That’s it for this quick tutorial. You should now be able to calculate the chi square statistic in SPSS, and interpret the result that appears the SPSS output viewer.